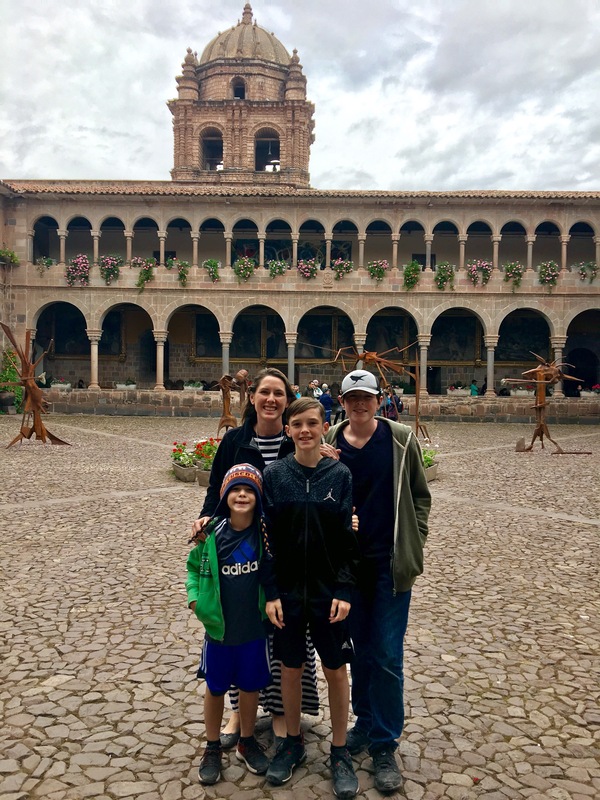 In a text to my family after the first five days to Cusco I wrote, “I think Cusco is rejecting us.” It really did feel that way. At the time of my comment, Jeromy had been in the hospital for two days with severe elevation sickness, Tyler was in the same hospital in the room next door and Parker had been seen by a doctor the day before, plus prescribed antibiotics for a sinus infection. It was definitely one of the low points of the year. At least he had a nice view! 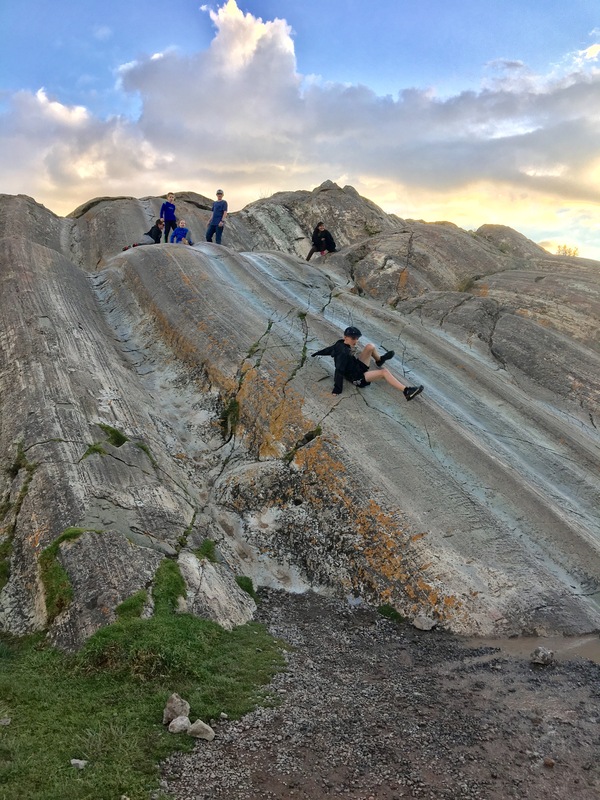 In response to the text my sister-in-law wrote, “I think you better get out of there as soon as possible!” While that ended up being the right course of action for Jeromy who ended up flying to Lima two days later, I am really glad the rest of us decided to stay. 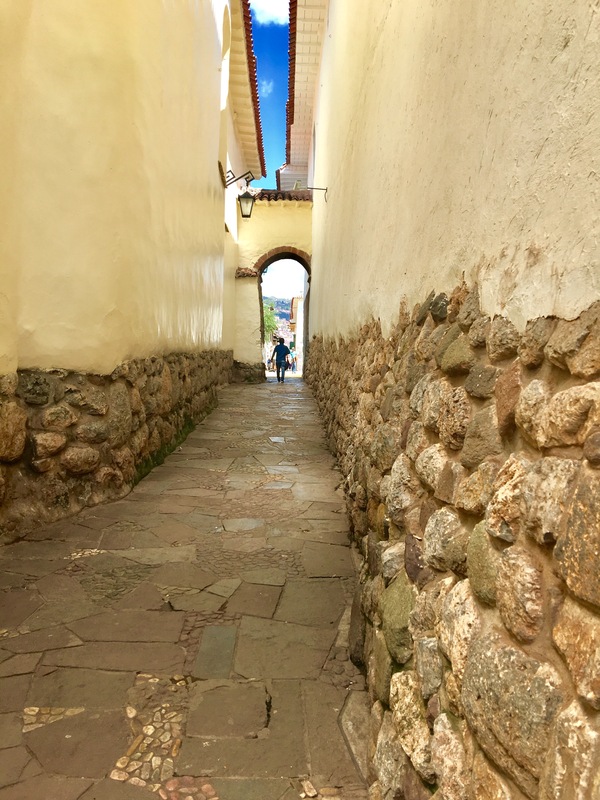 After the first terrible week, our time in Cusco ended up being a really wonderful experience. 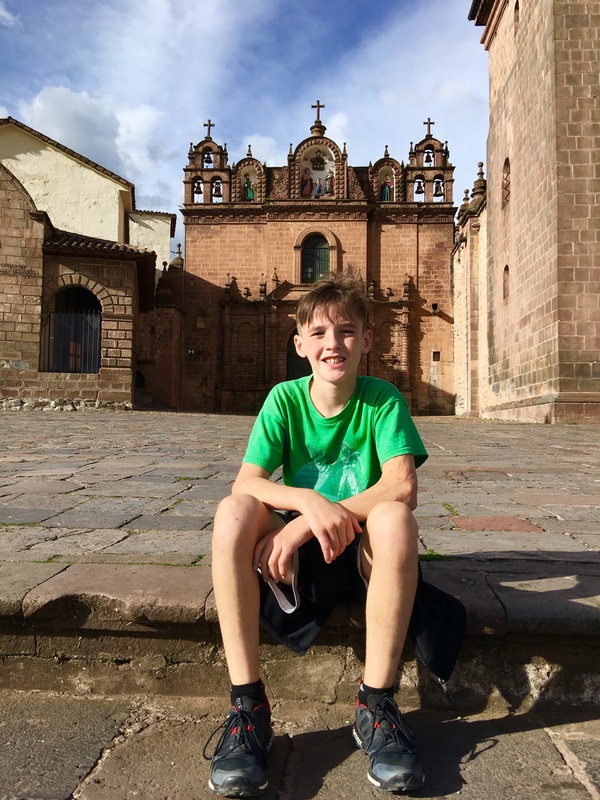 I am hoping that at some point in the future, when he doesn’t have some unknown atypical pneumonia in his lungs, I can bring Jeromy back to show him all the things I loved about Cusco and the surrounding area. 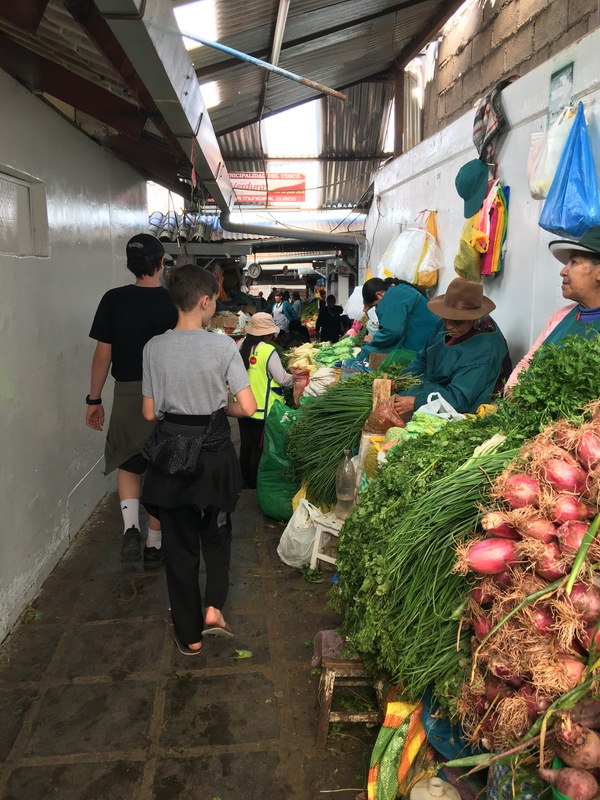 A picture of Jeromy walking the streets of Cusco before his untimely departure. 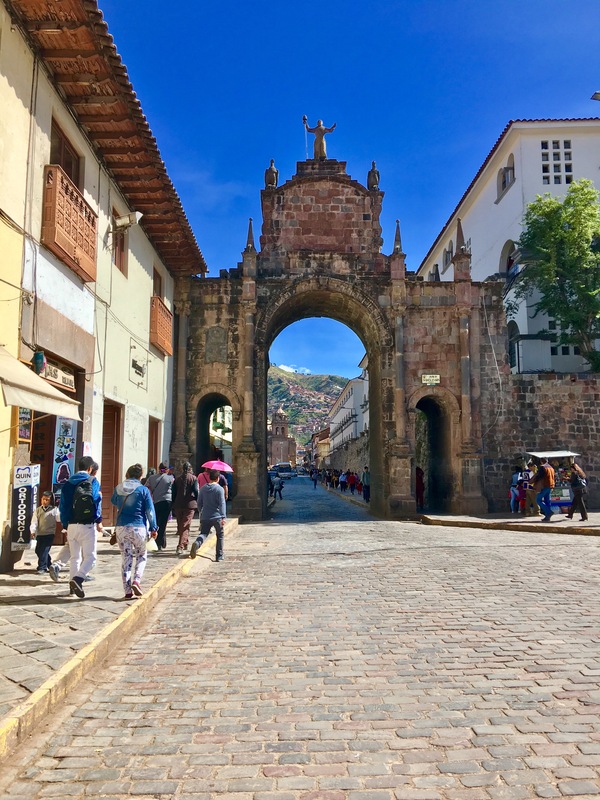 Let me back up a bit though…we arrived in Cusco on a beautiful sunny day, and had arranged a driver from the airport. 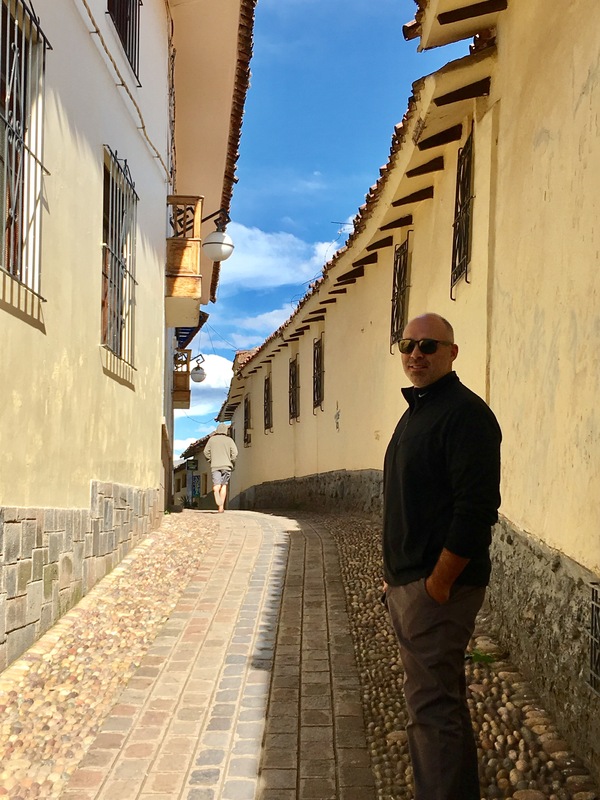 He took us right to our Air BNB apartment in the Lucrepata area of Cusco. That day, we got settled in, had our first walk around town and dinner at a delicious restaurant. I immediately fell in love with this beautiful city! A few days in, we were in language class and Jeromy started acting really strange. 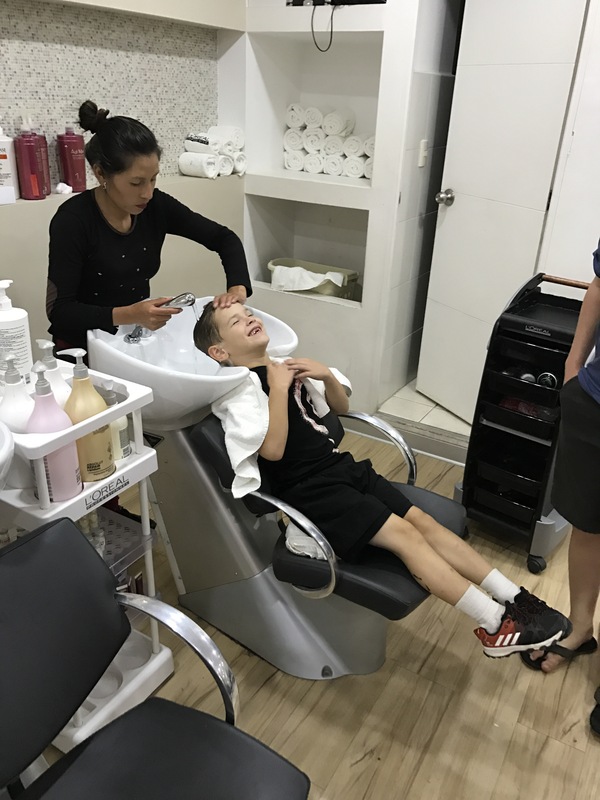 He had been feeling short of breath and had a bad headache for the preceeding several days, so I suggested he go see the doctor at the school. 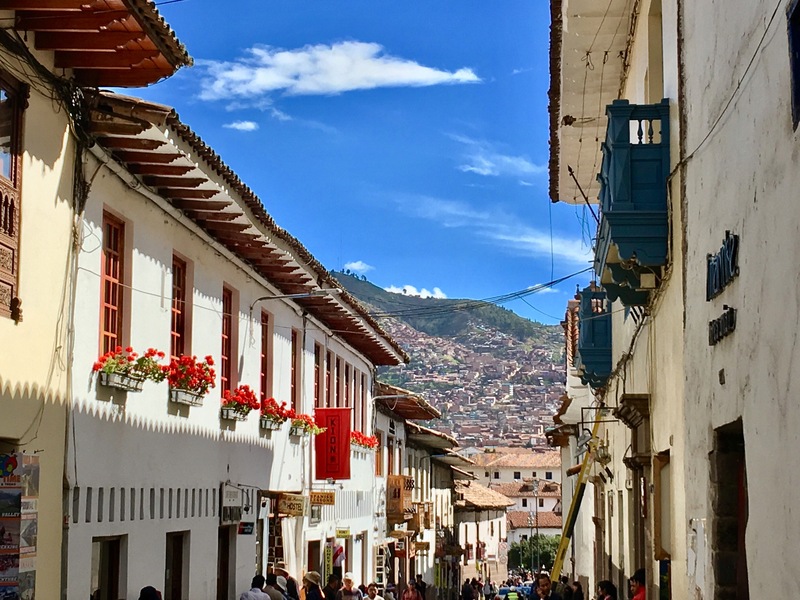 The headache and shortness of breath actually aren’t that uncommon in Cusco which sits 11,400 feet above sea level. All of us had these mild symptoms of elevation sickness the first few days until we got adjusted. The problem was, Jeromy’s symptoms just kept getting worse and when he started forgetting simple things, I knew it wasn’t a good sign. He waited until the class break, then headed down to see if they could help him. They did a couple tests and immediately escorted him over to the hospital. When he arrived his oxygen levels were only at 60%! 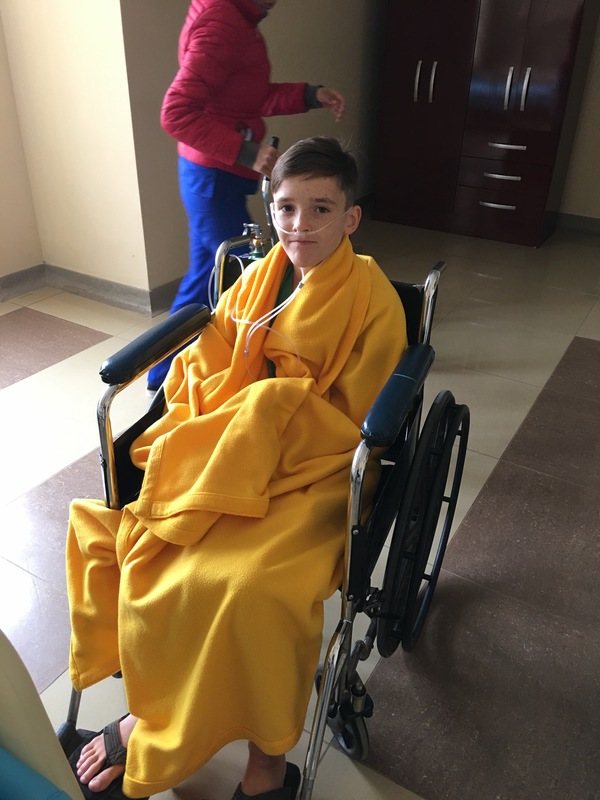 This is very bad (typically 98%+) and he was immediately put on oxygen treatment, which after a couple of hours usually solves the problem rapidly. Well, after 4 hours of oxygen, Jeromy’s levels had barely increased at all. The doctors ran a bunch of tests to see what the issue could be but weren’t able to find the cause. The next day, Jeromy’s oxygen levels were still low, and they still couldn’t figure out what to do. 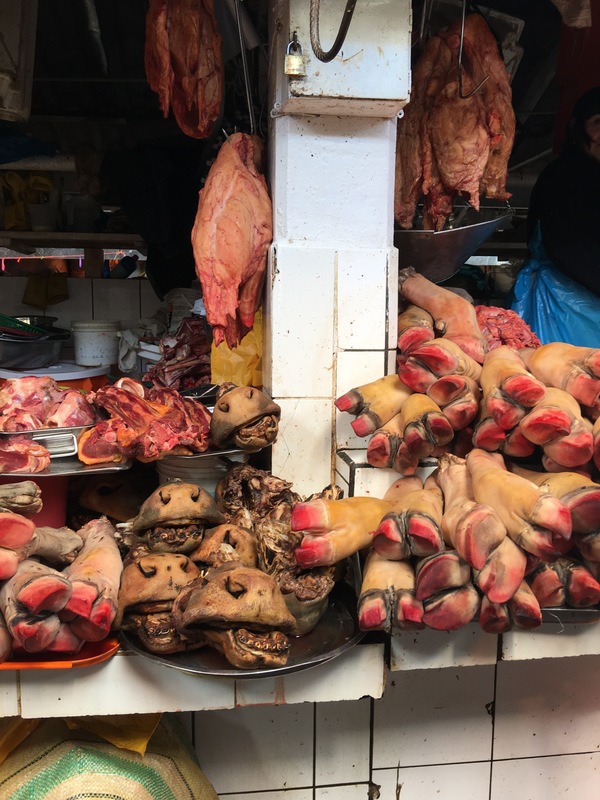 We had some friends who were living in Lima on a mission for our church and I contacted them to see if they would be able to send some missionaries over to give Jeromy a priesthoood blessing (special prayer). They showed up right away and although they only spoke Spanish, we both felt the comfort of the Holy Spirit as they blessed him. About 10 minutes after they left, a man came walking into the room who we didn’t recognize. 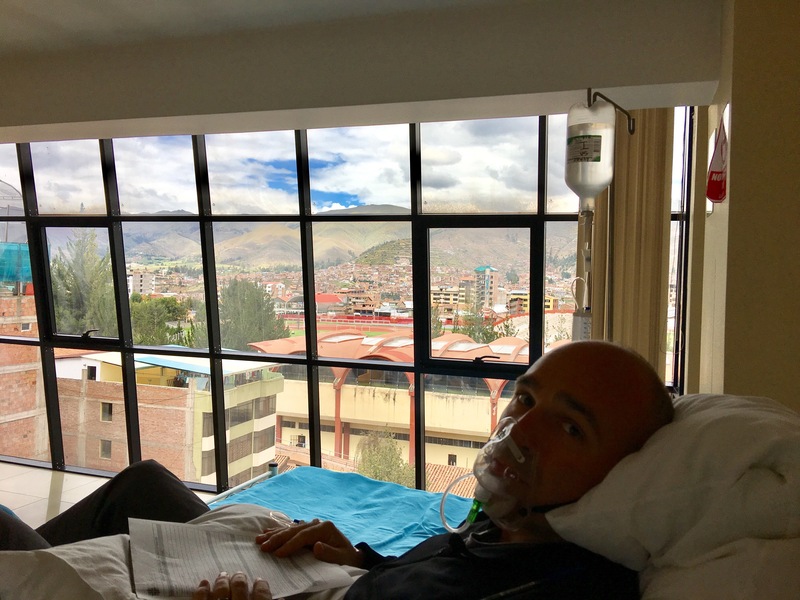 He introduced himself as a doctor at the hospital who specializes in altitude sickness. 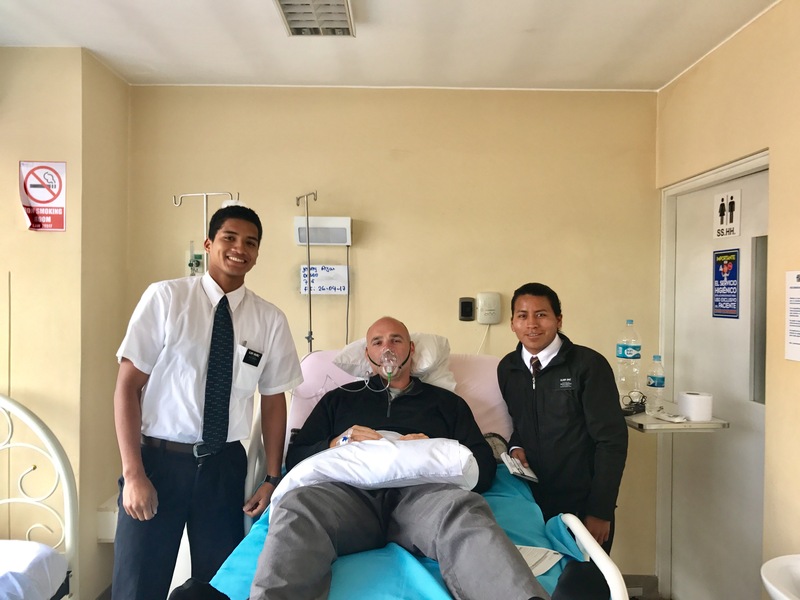 He had just seen the missionaries leaving the hospital and as he is a member of our church, he asked them what they were doing there. They explained they had come to visit Jeromy and give him a blessing. The doctor felt impressed to come in and check in on Jeromy to see how everything was going. After looking through his lab results and chest x-rays, he came up with an answer that the other doctors hadn’t considered yet. Pulmonary edema, or water in his lungs and it just so happens, because this was his specialty, he knew the best way to treat it! This truly felt like a miracle to us and an answer to our prayers. 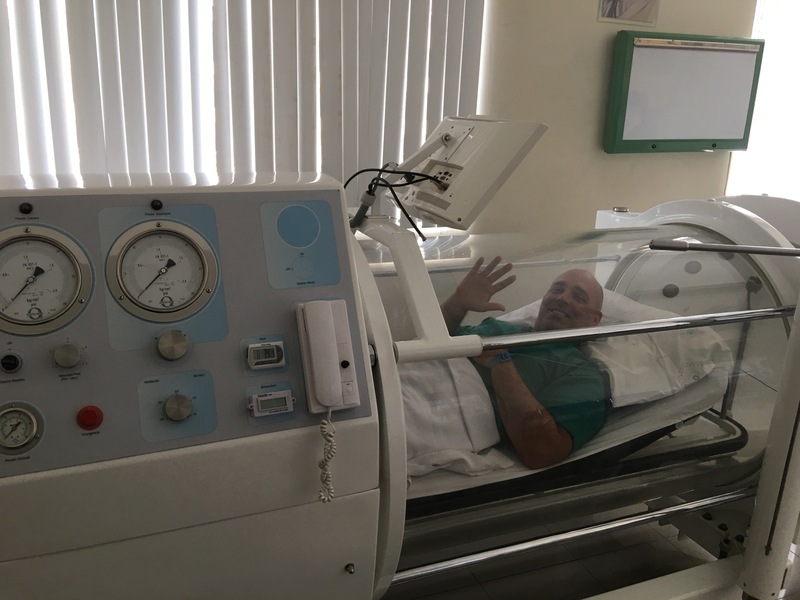 He was able to get Jeromy into a hyperbaric chamber and that immediately helped him feel better. 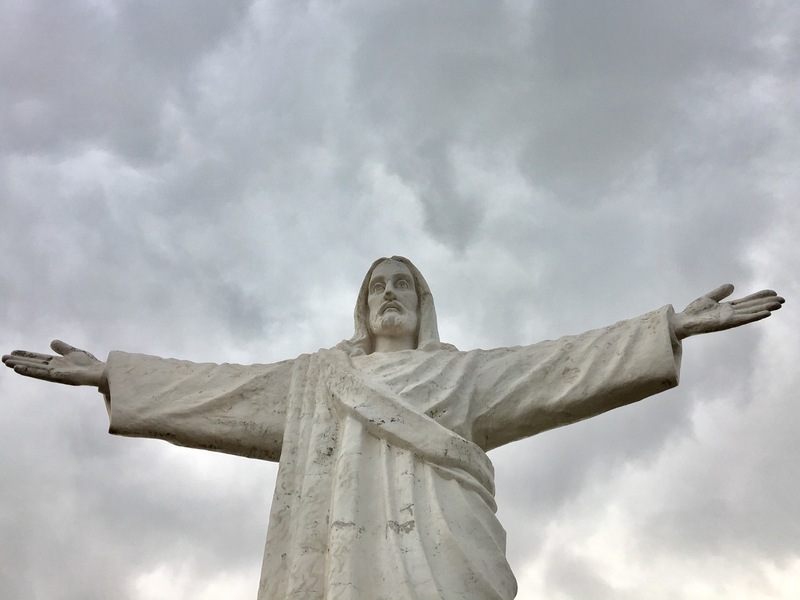 Although he felt a little better, it didn’t solve the underlying issue that he was not adjusting to the elevation and the water, and maybe atypical pneumonia, in his lungs would not likely go away if he continued living at the high elevation. 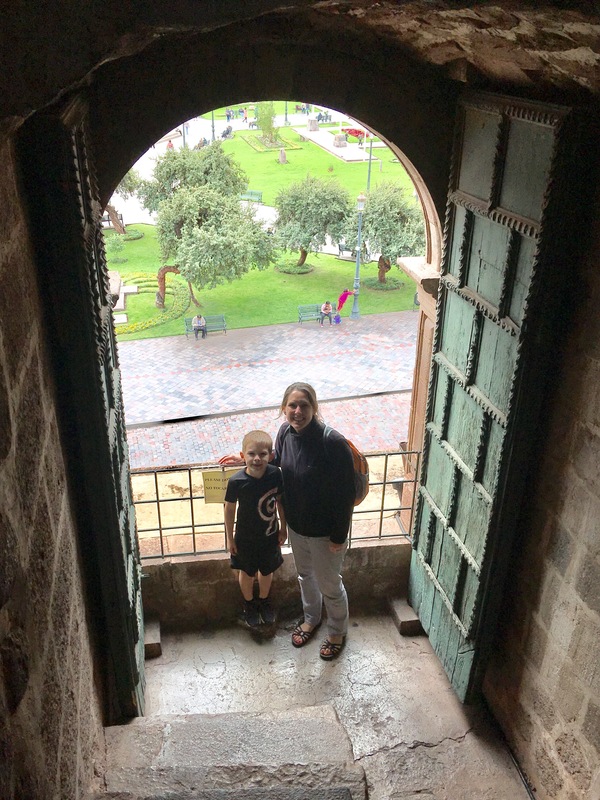 So once he was stable enough, Jeromy left directly from the hospital, to the airport, and spent the next 2 1/2 weeks in Lima until he could meet up with us again at lower elevations. In the meantime while Jeromy was in the hospital, Parker was suffering from a severe sinus infection. 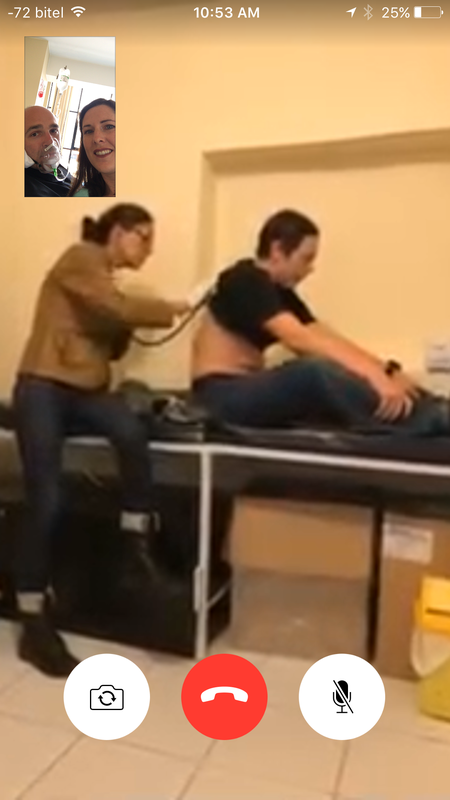 So Karen, the incredible doctor from our Spanish School, was able to Facetime me from the school while she examined Parker. I have to say, I don’t know what we would have done without Karen. She was so helpful and an amazing doctor. She spent hours with Jeromy as they tried to find the source of his issues. I am so grateful we had her with us through this ordeal! The second night Jeromy was in the hospital, Tyler started having severe abdominal pains and shortness of breath. So at midnight, we stumbled out into the street, looking for a taxi to take us to the hospital. The only good thing about Jeromy being in the hospital already was that at least I already knew where to go! We finally found a cab and the driver sped quickly to the hospital while Tyler was curled up in pain, crying next to me in the taxi. They admitted him and put him in the room right next door to the Jeromy! Fortunately, after a night of oxygen therapy and some fluids, Tyler felt better the next day, but I was feeling pretty strung out! To top it all off, while it was probably the worst few days of our trip, it was also the most expensive! 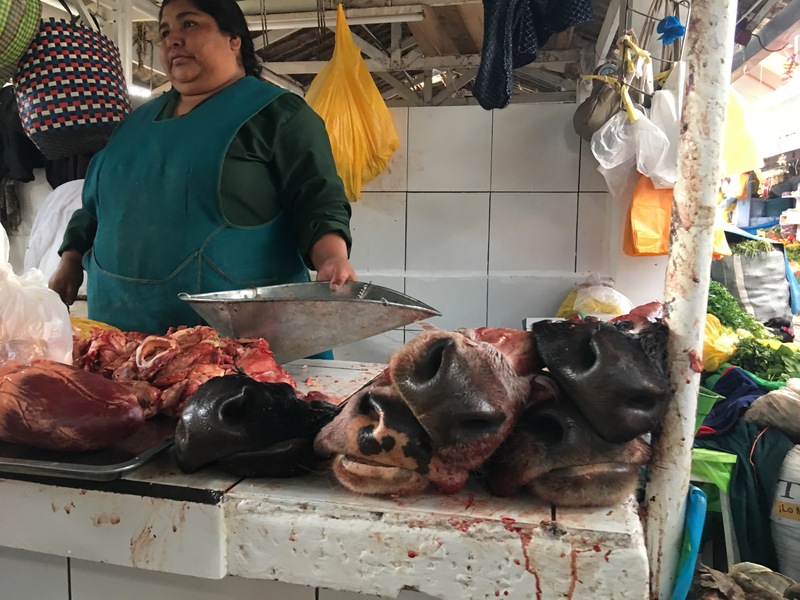 Those Peruvian hospitals are not cheap! 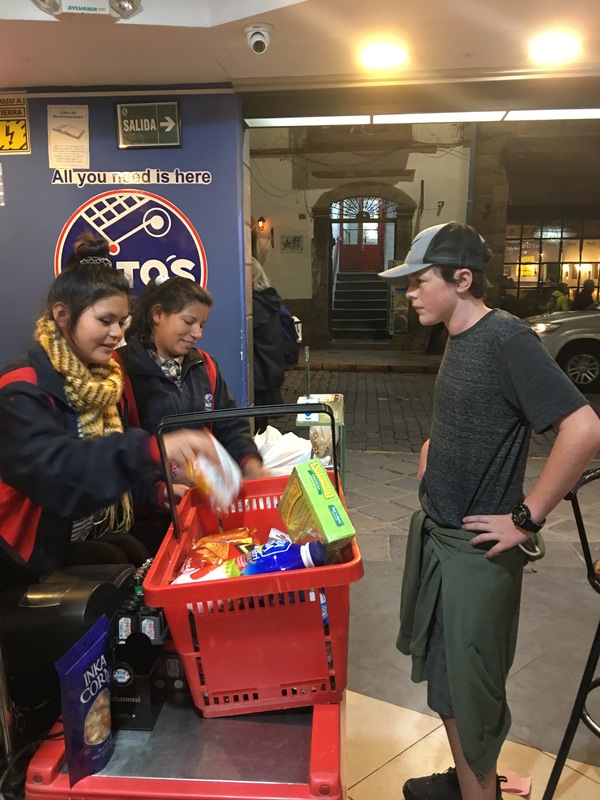 After that week, things starting looking up for us though, and we were happy we decided to stay and finish our time in stunning Cusco. We fell into a simple routine while we were there. We would get up each morning and have breakfast at our apartment before heading down the hill to our Spanish School. 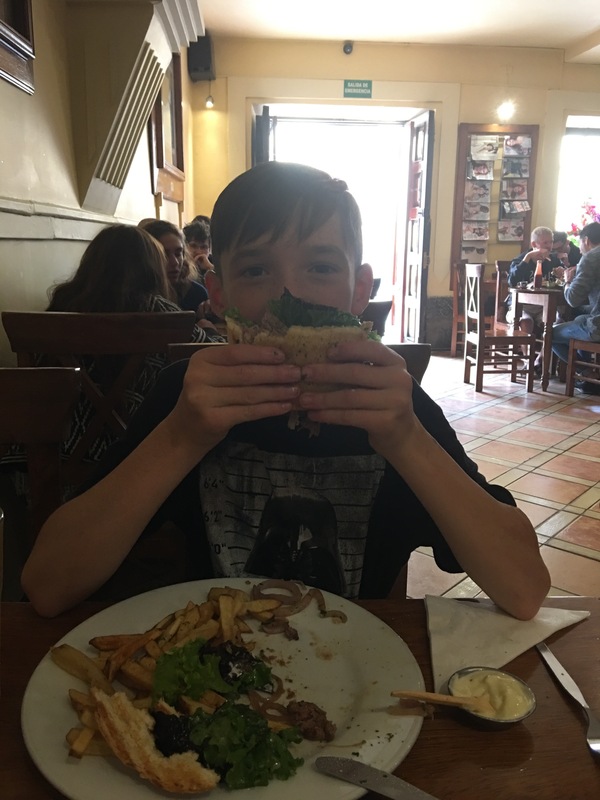 After school, we would get lunch at one of the many delicious restaurants in Cusco, and then we would spend the afternoon visiting various museums, markets, historic sights, etc. After dinner we would head back home where we would do our homework (it had been a few years since I’ve had to do that!) then read (me) or watch YouTube/Netflix/Amazon for the night. The next day we would repeat, sometimes having to do normal life things like buying groceries and getting our haircut as well. 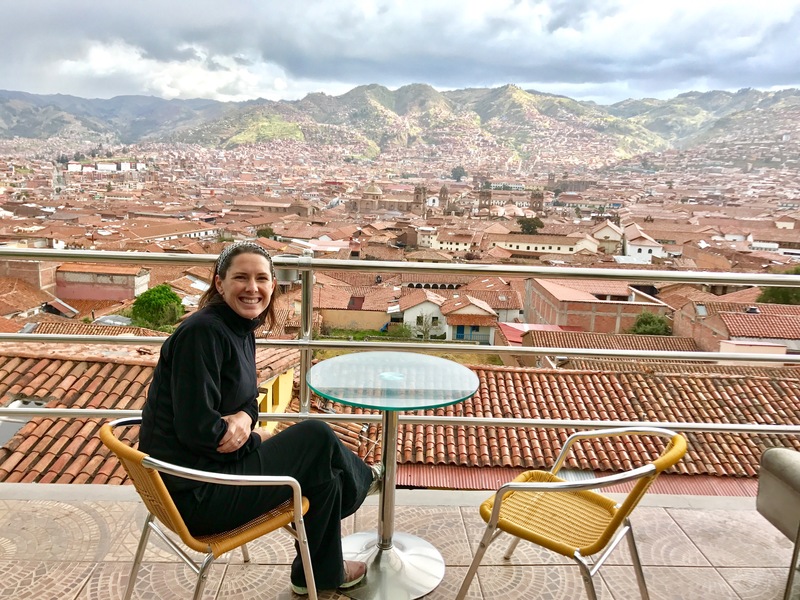 The weekends, we spent exploring outside of Cusco in the Sacred Valley. 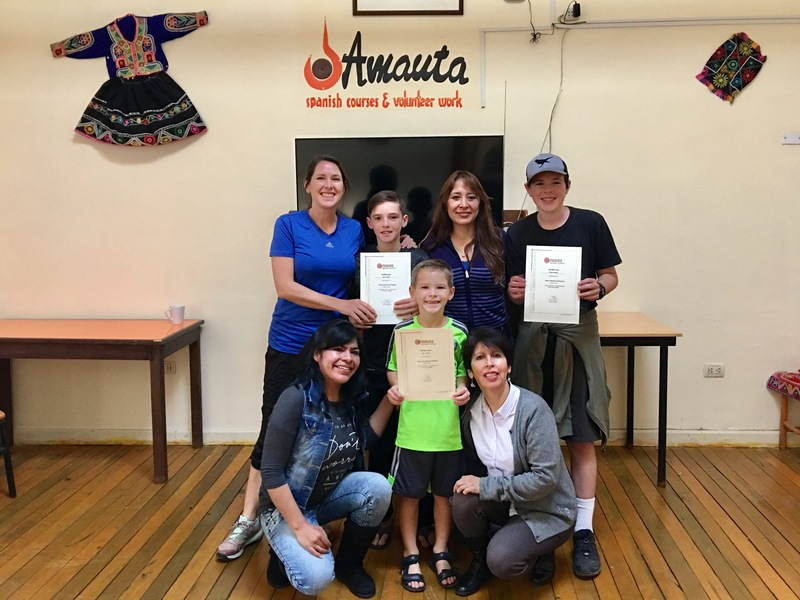 We loved learning Spanish at Amauta! 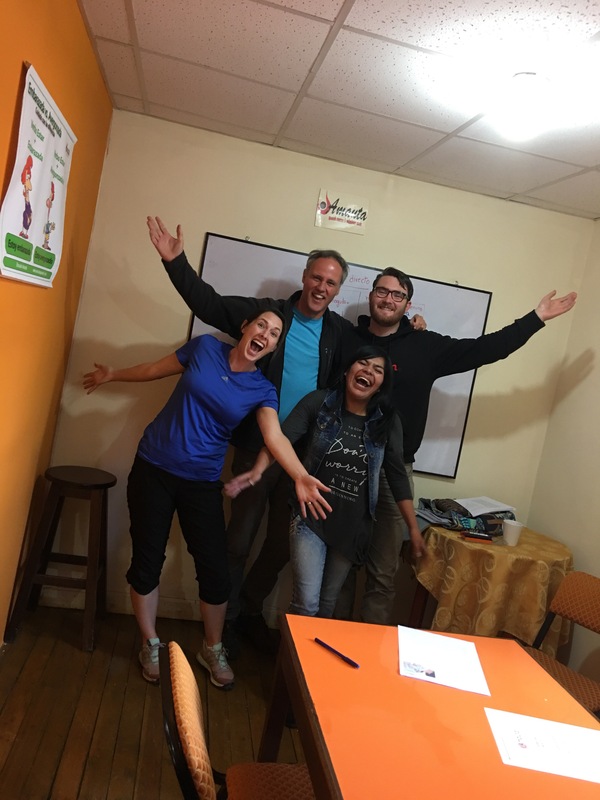 I was a bit nervous at first that we would be bored having 4 hours of class a day for three weeks, but the instructors kept us all engaged and enjoying ourselves. 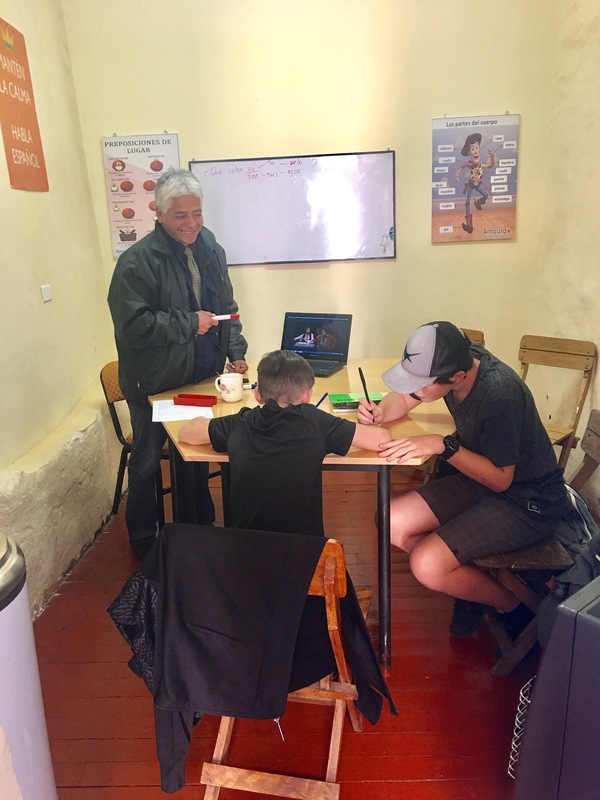 We also had two different instructors each day (but they stayed with us for the week), which helped us learn different accents and each had different teaching styles to keep it interesting. 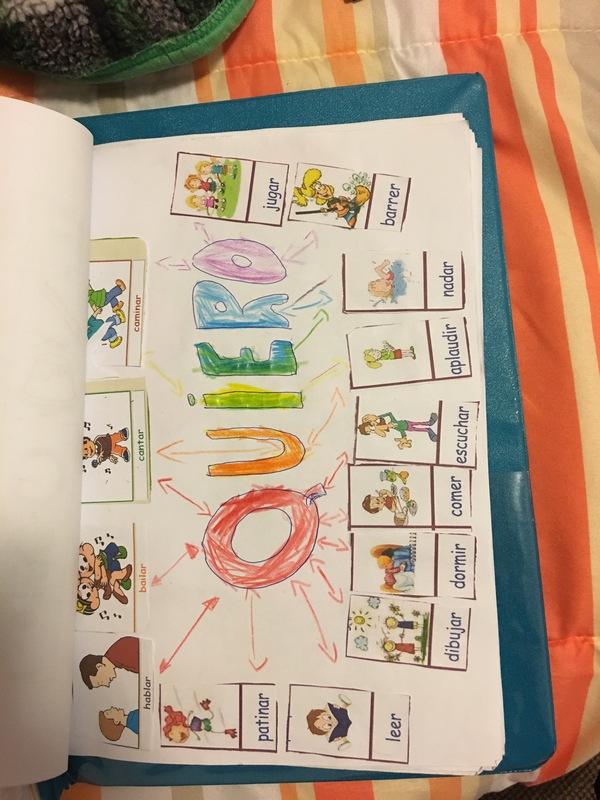 Luke had his own teachers and they taught him through activities like throwing a multicolored ball to learn colors and coloring pictures of the different feelings. Luke did have his days where he was a little stubborn and chose not to learn, but overall he was able to learn a lot and have fun doing it. Parker and Tyler were in a class together. 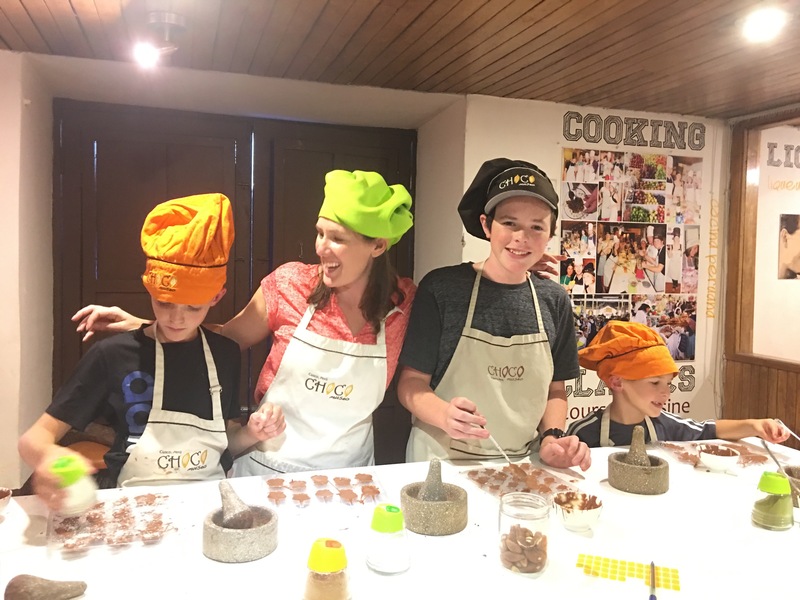 Their class was the most interactive with trips to museums or the market, as well as learning numbers playing bingo and colors using Jenga blocks. They would have homework every night, like me, and did it themselves without any prompting! This is exactly the opposite response I get when I ask them to do schoolwork. I have always enjoyed learning, and I am often reading and trying to better myself, but I hadn’t been in a classroom setting for 17 years! I really loved it and I went from not speaking any Spanish to being able to communicate. I’m not fluent or anything, but I know enough now to get around and have a basic conversation. I also really enjoyed getting to know the other people in my class. 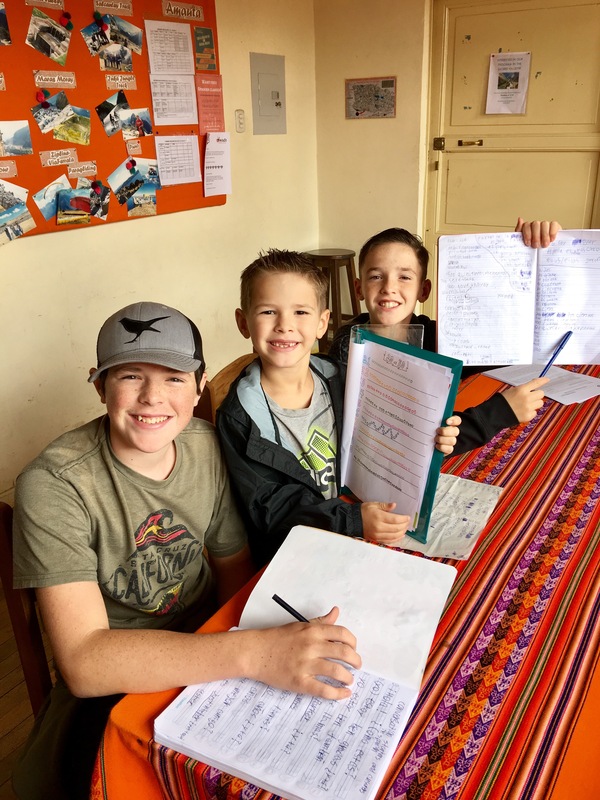 The school also provided evening activities, access to doctors (this really came in handy when Jeromy was in the hospital), a welcome tour to orient us to Cusco, and a “graduation” ceremony on our last day. 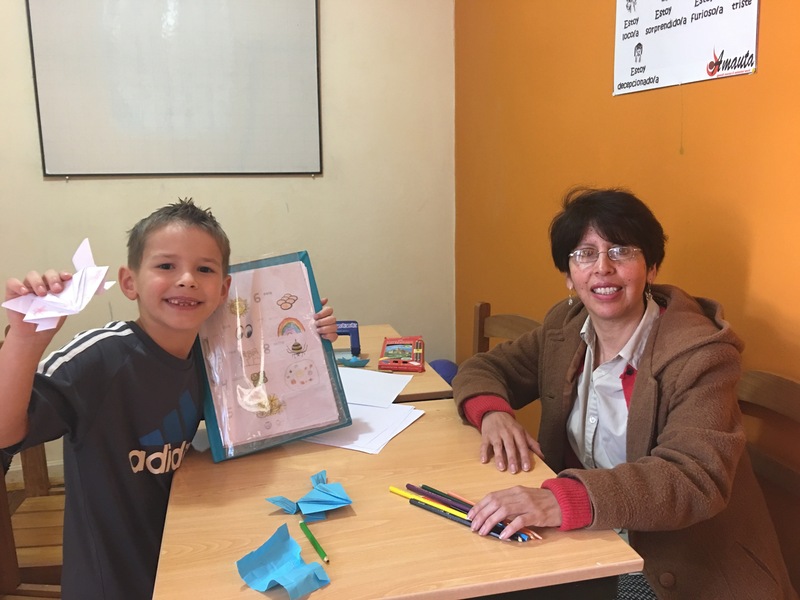 Overall, we had a really positive experience and learned some Spanish as well! Muchas gracias a nuestros maravillosos profesores!! 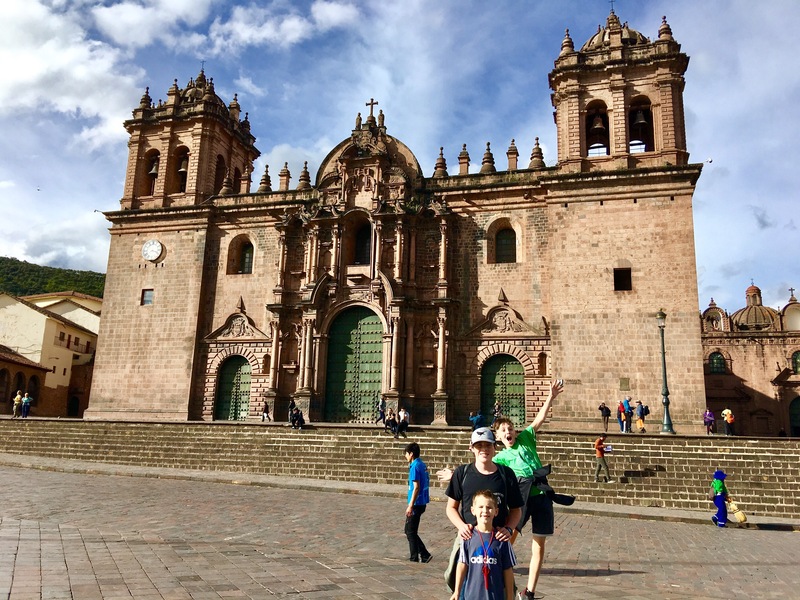 By the time we arrived in Cusco, the boys were getting pretty tired of sightseeing and it was hard to motivate them to want to do anything. So after Spanish school each day I would give them the option of doing our more structured school (math, English, etc.) at our apartment or exploring the city. 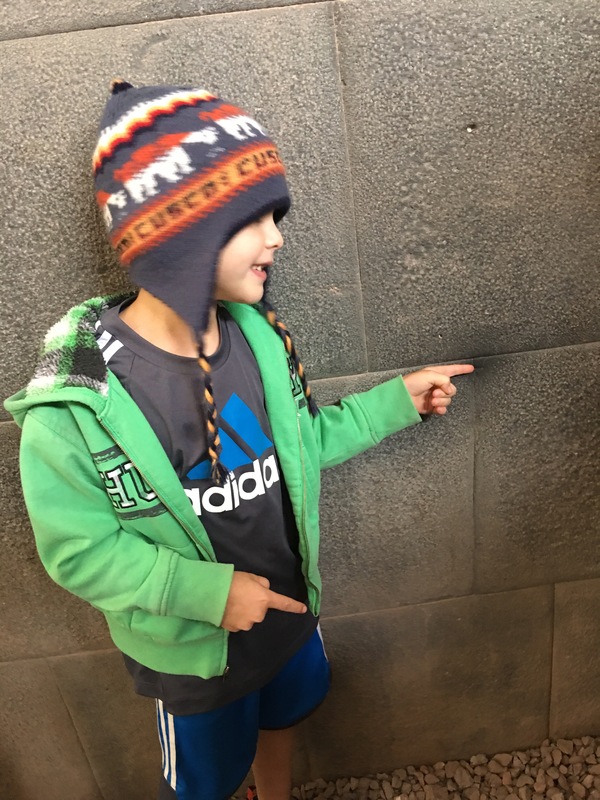 Although they didn’t really want to sightsee, it was better than school, so off we went to explore Cusco! 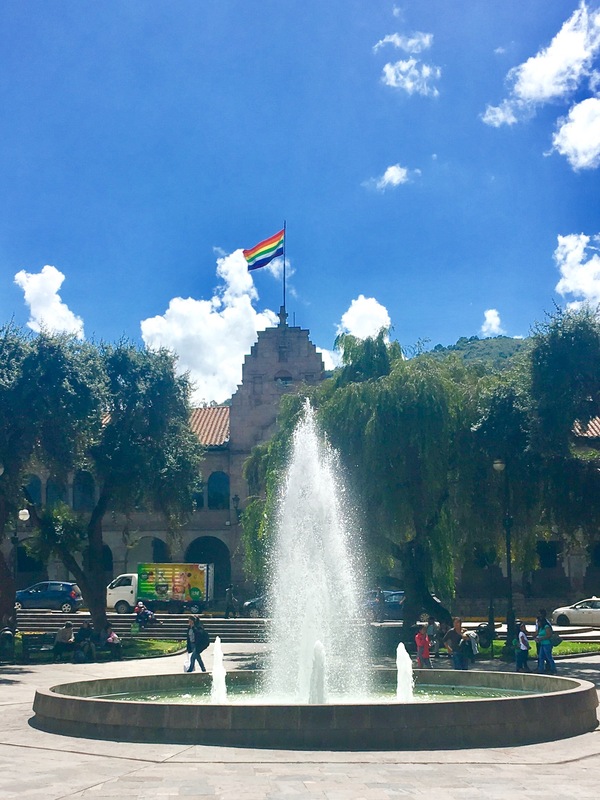 At first we thought it must be pride week with all the rainbow flags everywhere, but we quickly learned that the rainbow flag represents Cusco, Peru and is a symbol of their Incan history. 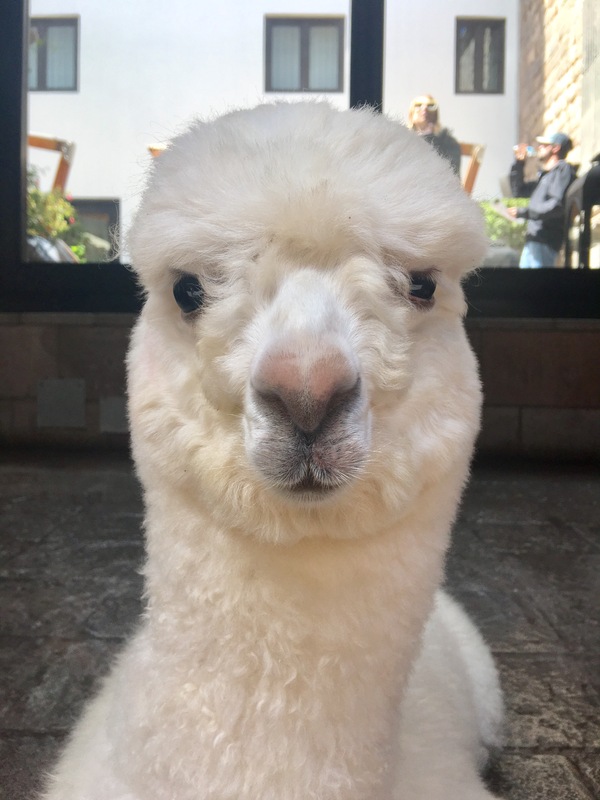 Immediately from our first walk through, Cusco had me hooked! It was this incredible blend of ancient Incan culture and ruins (many of the walls, that buildings are built on today, were from Incan times) Spanish influence and churches, local Quechua people, and the modern tourist industry all melded together creating a fabulous tourist destination and place for us to spend 3 weeks. 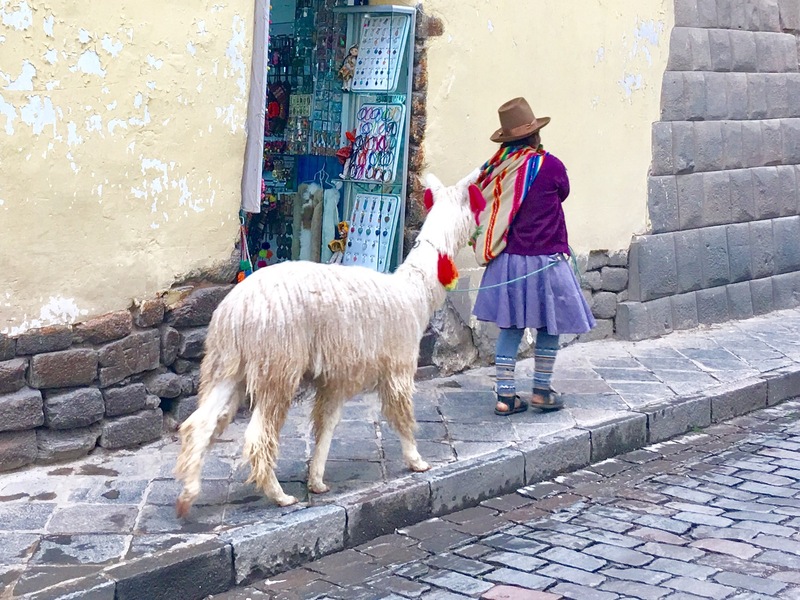 Cusco is said to have been created in the shape of a puma and was considered by the Incas to be the belly button of the world. One of their most important temples, The Sun Temple, was built there and we were able to tour through the ruins. 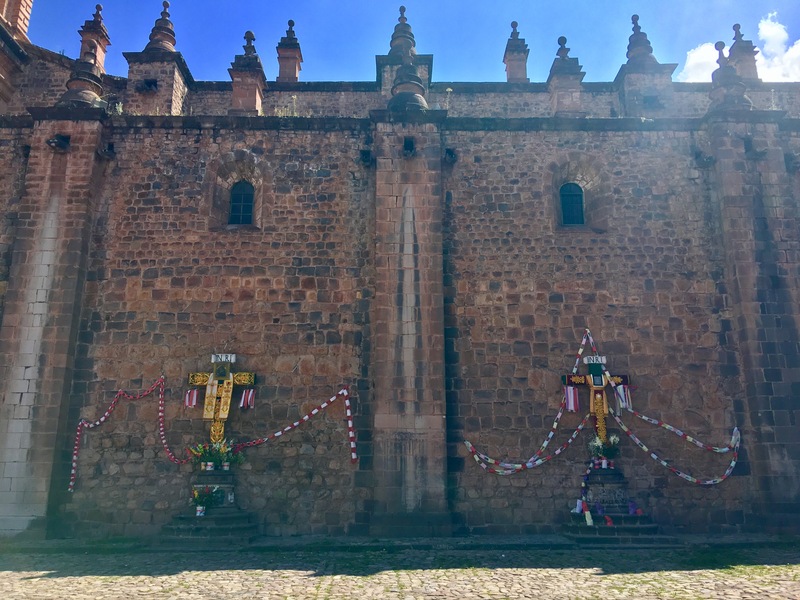 As with most of the Incan ruins, they were torn down when the Spanish came in and Catholic churches were built over them. However, over the years, many of the ancient sites have been restored. 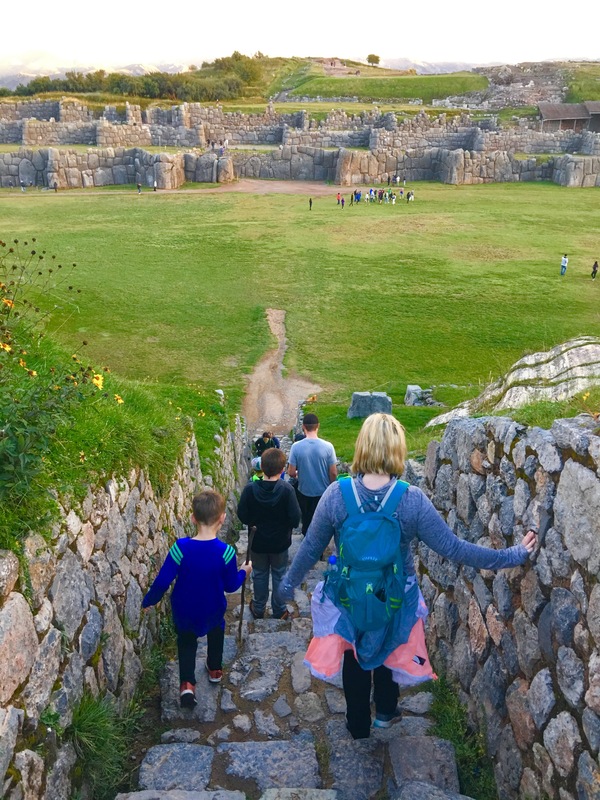 Everywhere we walked we were reminded of the Incas as we looked at the amazing walls built to perfection. No mortar was used and each rock was cut perfectly to fit with the rocks around it without any spaces. Below is the picture of the smallest rock we found (fitting perfectly), and one that has 15 different edges! I was told each year the people in the city clean the walls with toothbrushes to help preserve them. 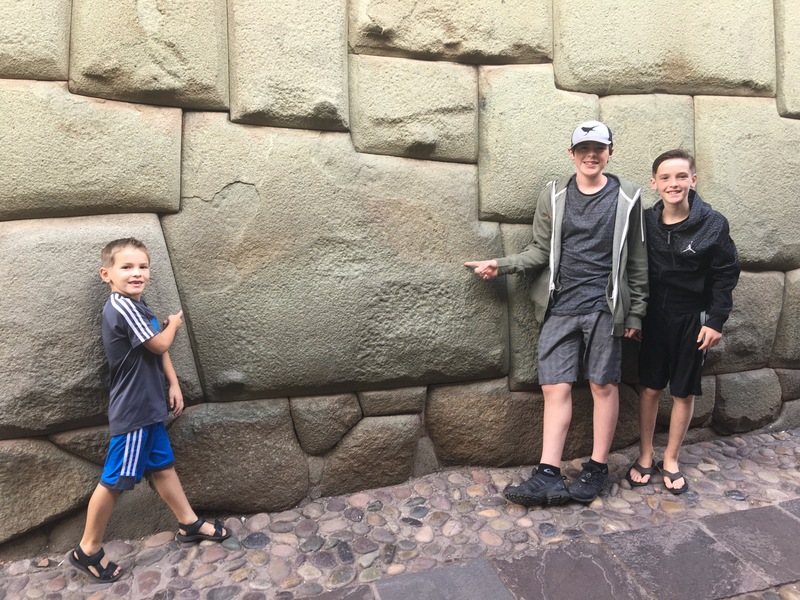 Not only is it amazing they were able to move these rocks in the first place (Some are huge! ), after centuries of earthquakes, and wear, they are still standing. It’s amazing to see what they were able to accomplish without any of the equipment and knowledge we have today! 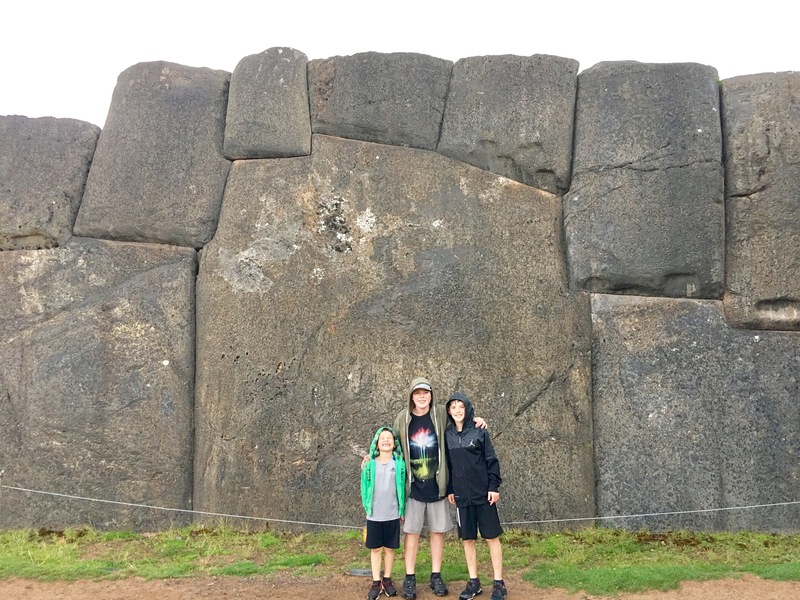 Our favorite spot in Cusco was visiting Sacsayhuaman. They are Incan ruins that sit in the hills overlooking Cusco. 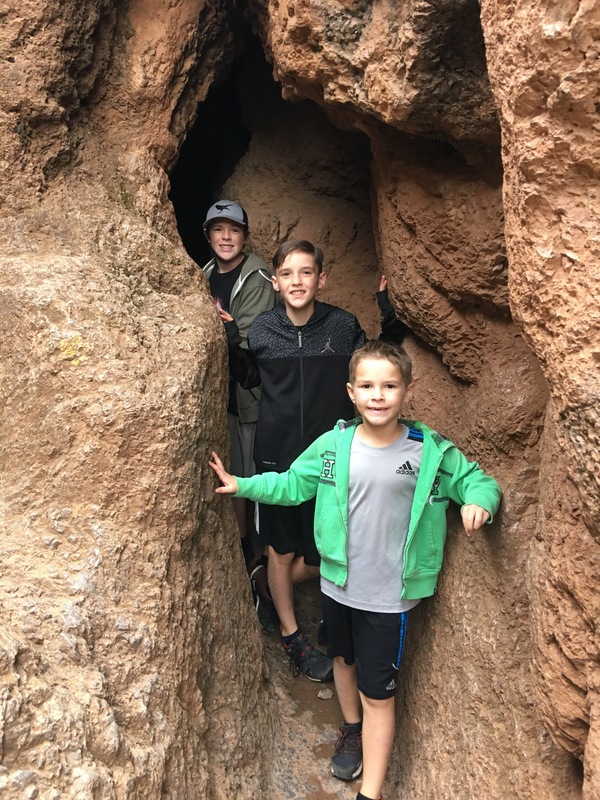 These surpassed the other ruins because they had some really fun natural slides and tunnels we could explore through! Always a hit with kids. The slides were fast but fun! 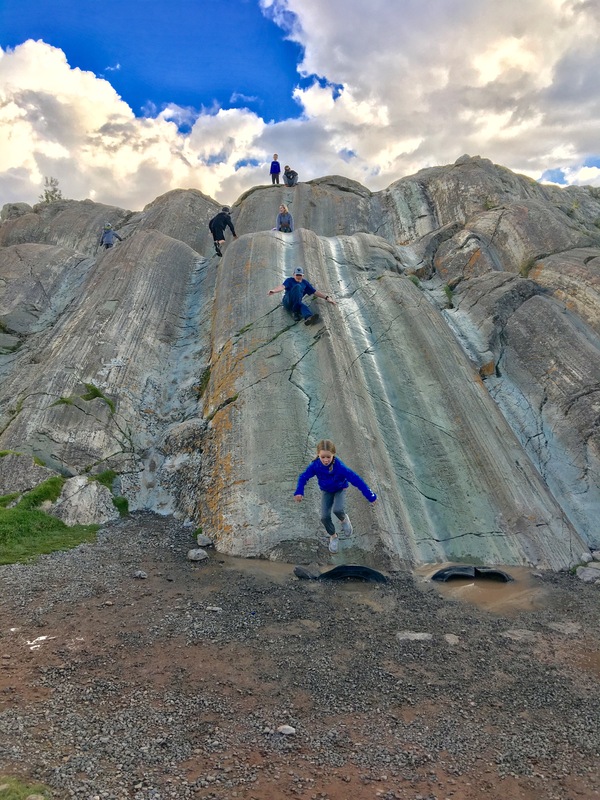 The boys couldn’t wait to go back and bring their friends Sophie, Soren, and Leif to play with them there. 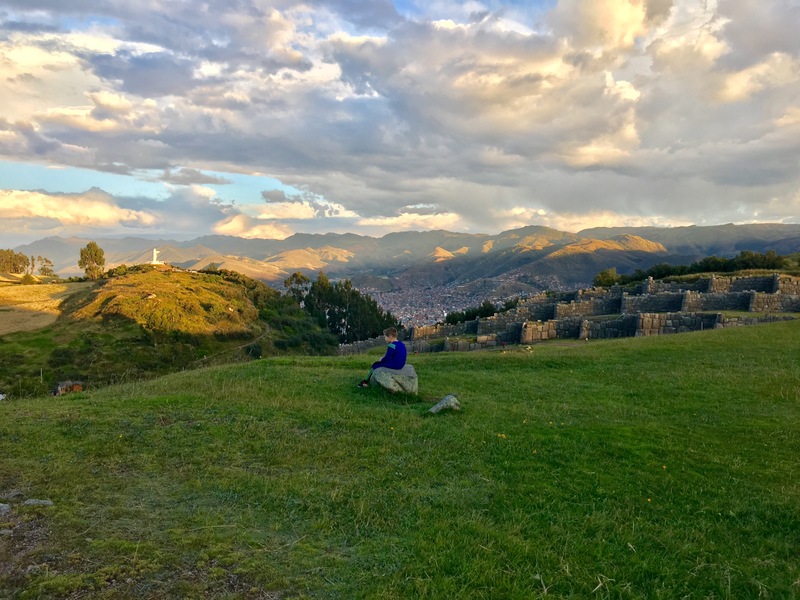 Near Sacsayhuaman is Cusco’s Blanco Christo looking over the city. 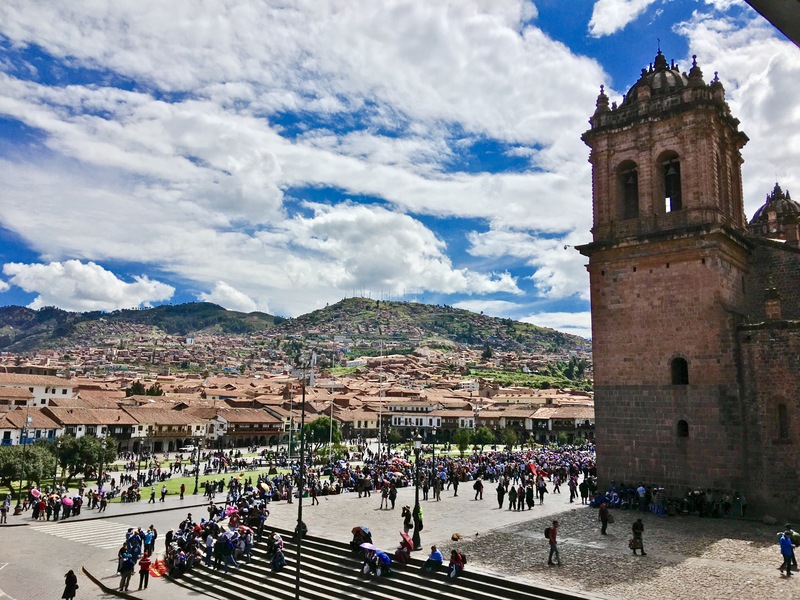 While the Incas are the foundation of Cusco, when the Spanish came they left their imprint on Cusco forever. 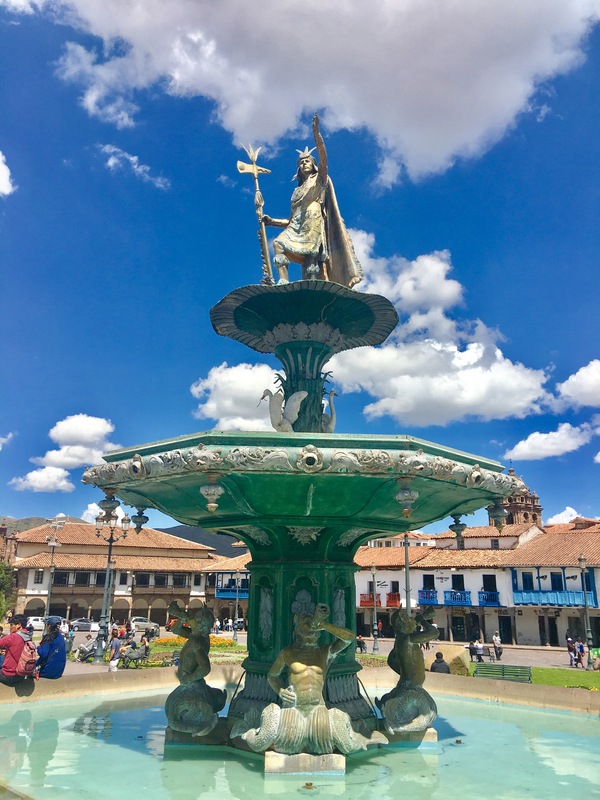 Gorgeous, Catholic churches and cathedrals, decorated in Incan gold and silver, dotted the city. The general architecture was also strongly influenced by the Spanish. 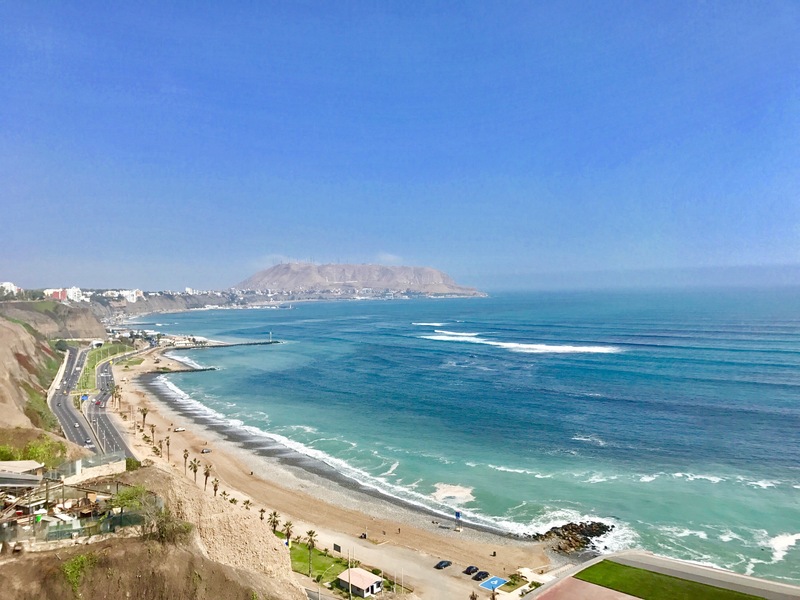 The influence of the Spanish permeates the culture, for example, a majority of the people in Peru are Catholic and many speak Spanish. 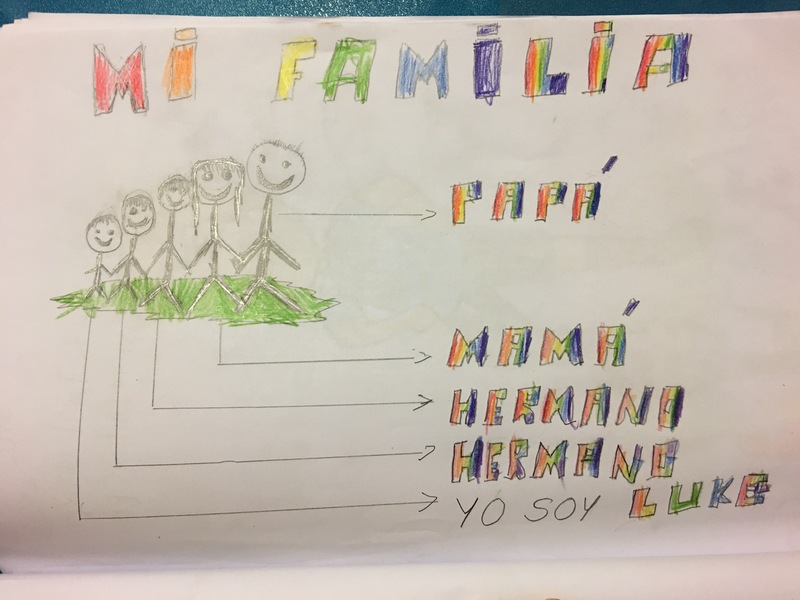 But not everyone speaks Spanish. Quechua is also a national language of Peru and many of the native people still only speak that, or speak both. 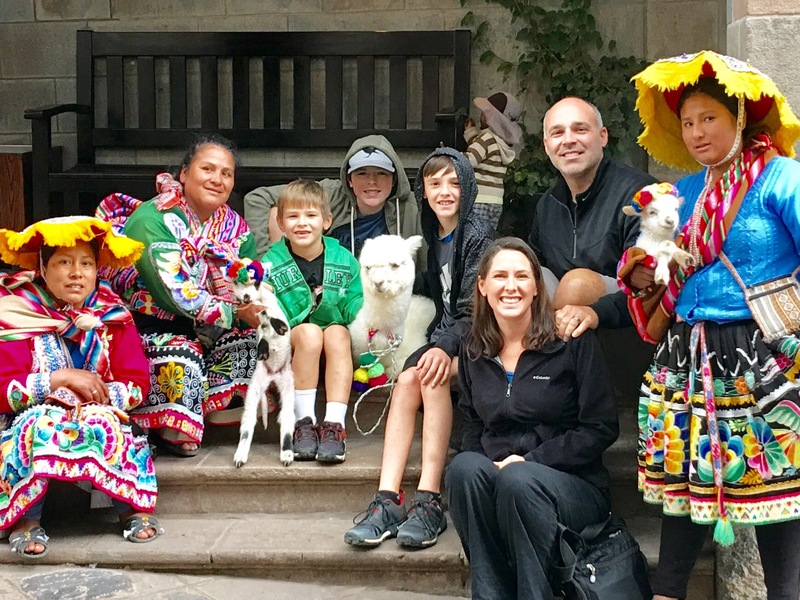 They have adopted the religion, but many traditions of their local Quechua culture are still practiced. 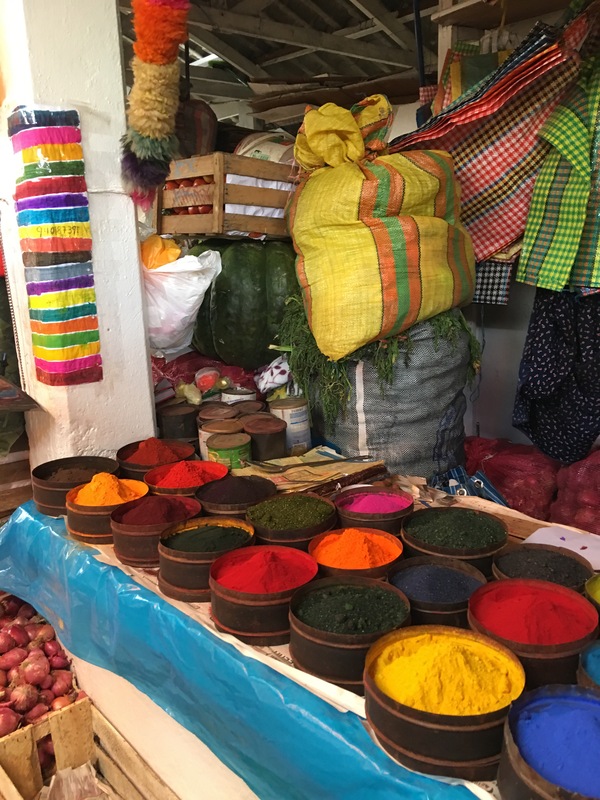 For example, we were told that if someone had a new home, they would have the Catholic priest come over one day to bless the home, and another day the local medicine man would then be invited over to also bless the house. They have found a way to blend the two cultures that works for them. 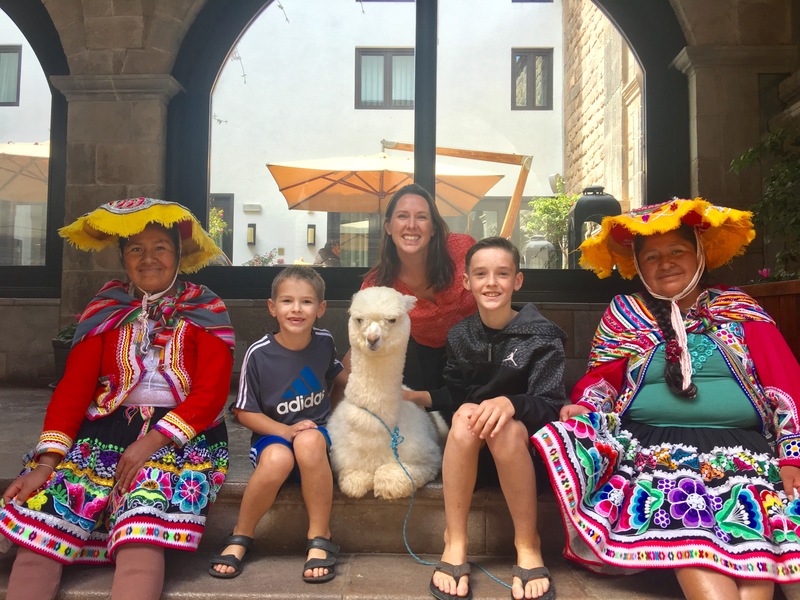 We loved seeing the colorful local people as they wandered around in traditional dress with their goats, llamas, and alpacas. 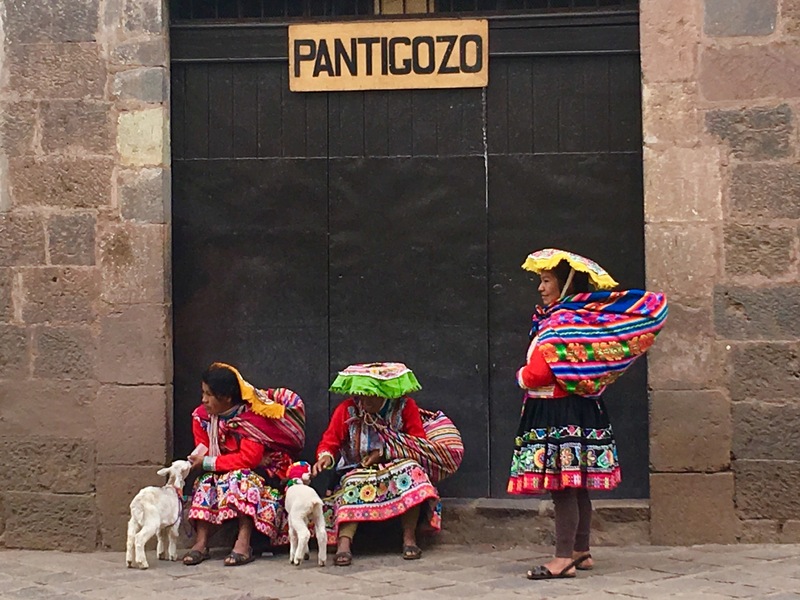 I know it was mostly to make money from the tourists, but they were always kind and helpful to us, and I loved all the vibrant colors of their traditional clothes. 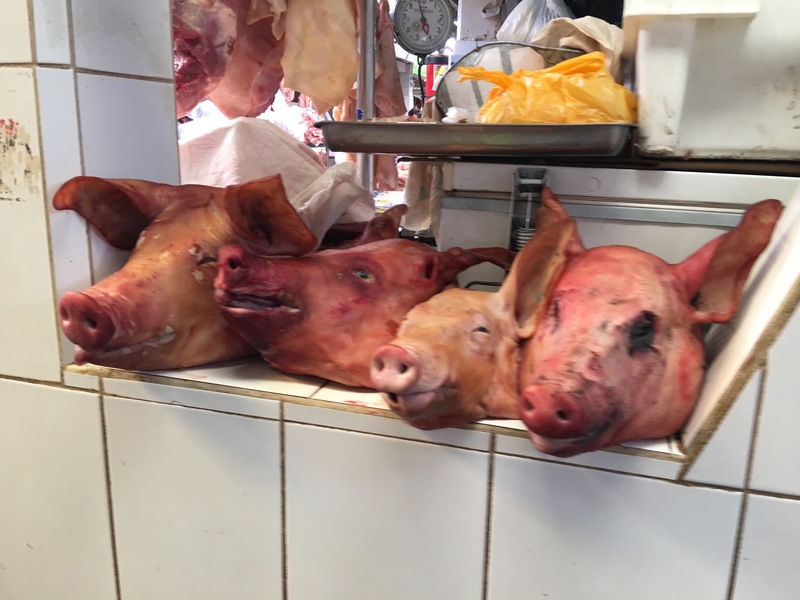 We did go to the local market one day as well. The boys had gone with their teacher from school and I had wanted them to take me for awhile. The problem was they refused to go right before a meal because they told me I wouldn’t be able to eat afterwards. 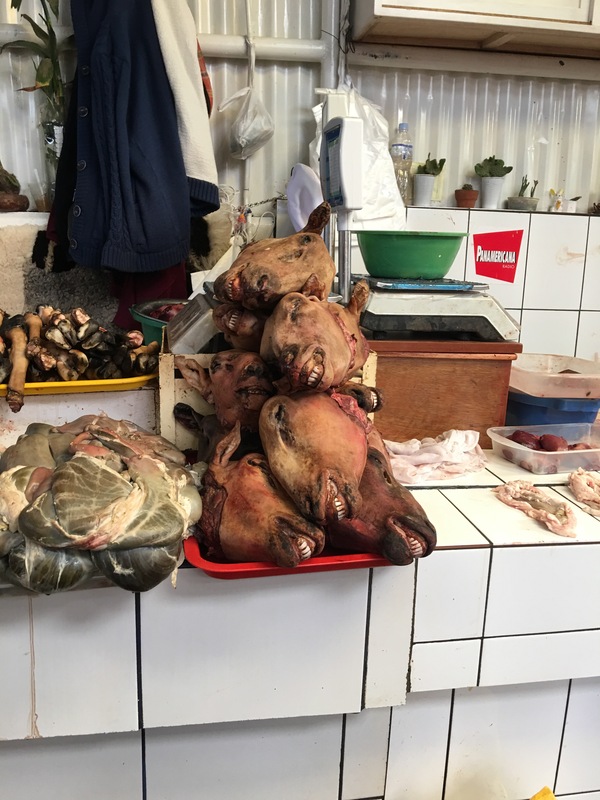 I thought they were exaggerating it a bit, but after seeing skinned and fried guinea pigs, a man cutting a goats head in half with a saw, and just experiencing the smells, I understood their hesitation and appreciated their consideration for my comfort a little more! If all the local culture wasn’t enough, there were tons of amazing restaurants to eat at. 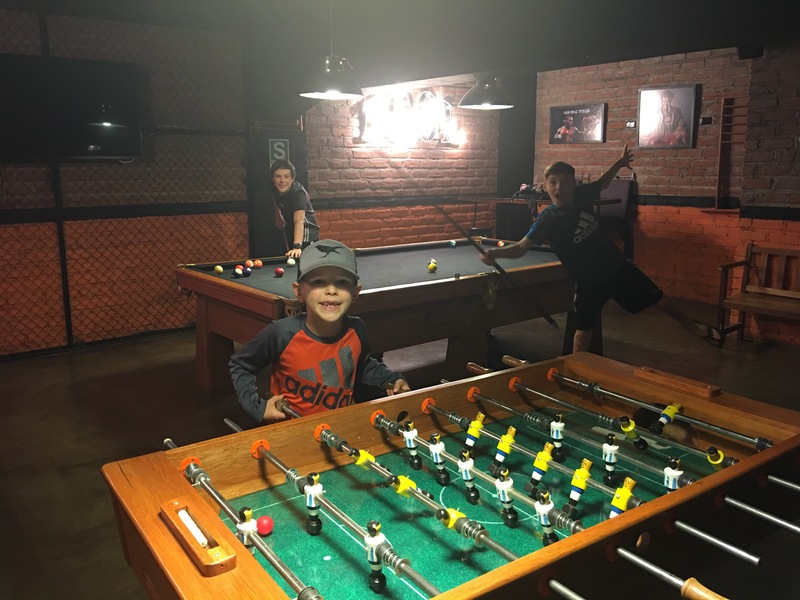 A couple of our favorites were The Sport’s Bar and Jack’s Cafe. The waiters got to know us and were always willing to let me practice my Spanish with them. 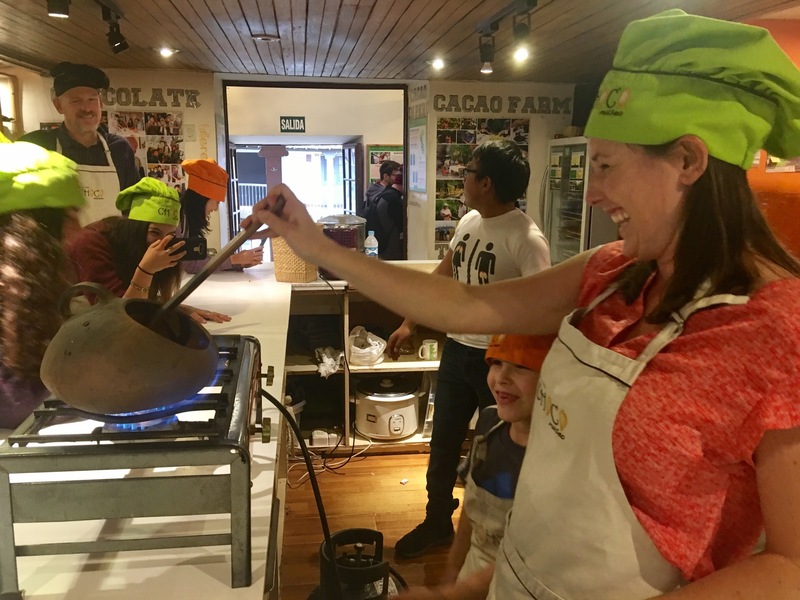 Perhaps one of the things we enjoyed the most was going to the Choco Museo. 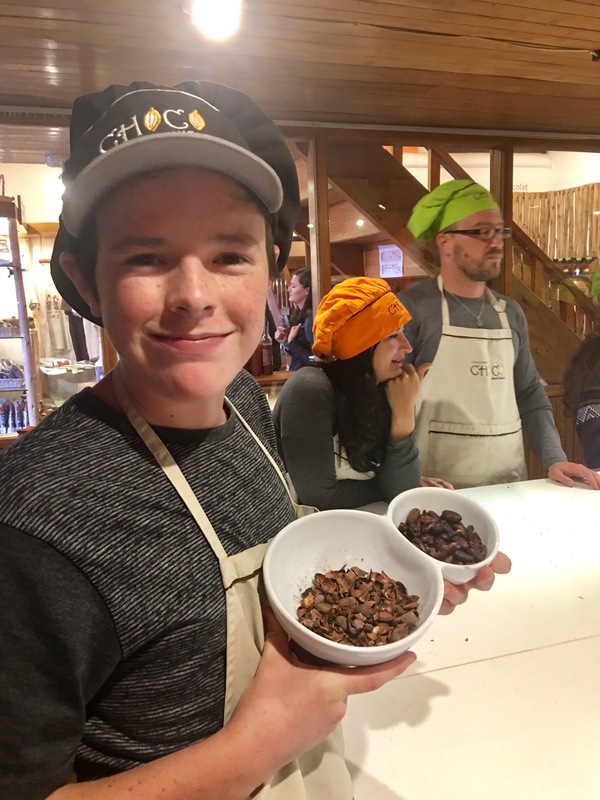 We signed up for a class on making chocolate and they took us through from the very start! 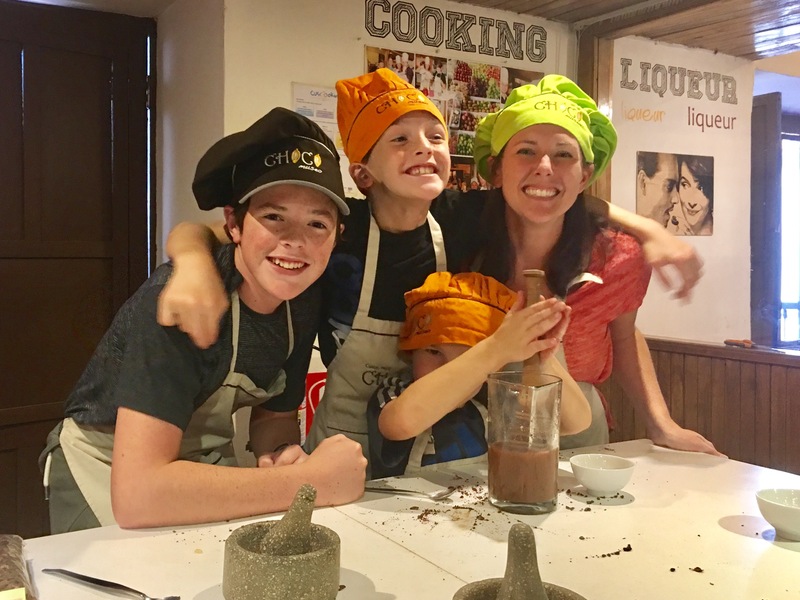 Not only did we learn a lot about chocolate, we had so much fun doing it! 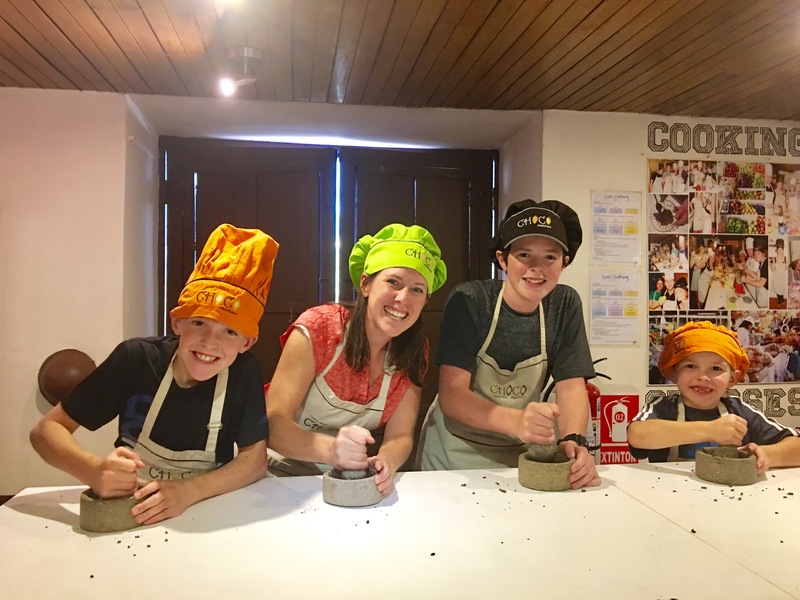 Our teacher let us know that you have to dance during many of the steps of making chocolate and played the soundtrack to make us all join in. We had a blast and were laughing most of the time! 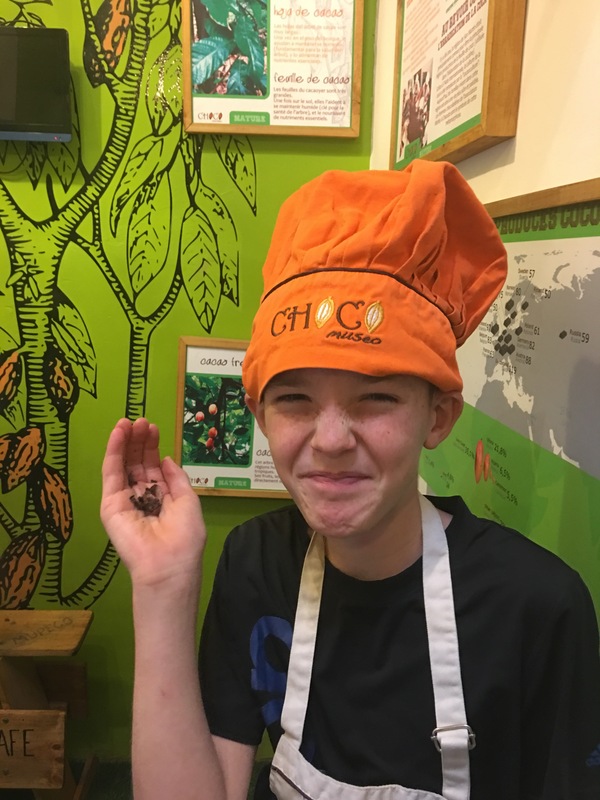 Start with a cacao pod. The beans are then fermented and dried. We didn’t participate in this part, but we did taste them. They were not very good! The next step is to roast the beans (while dancing of course). After the beans have been roasted we had to shell them. 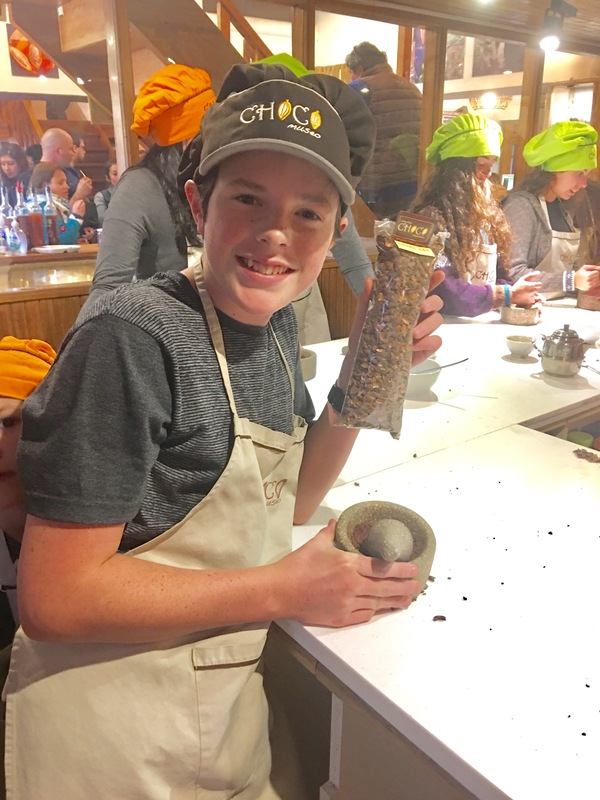 The shells can be made into a chocolate shell tea that while it isn’t amazing tasting, is still pretty fun! Once the shells have been removed it is time to crush the beans into a powder. We had a contest to see who crushed it the best (while dancing of course) and Parker won! 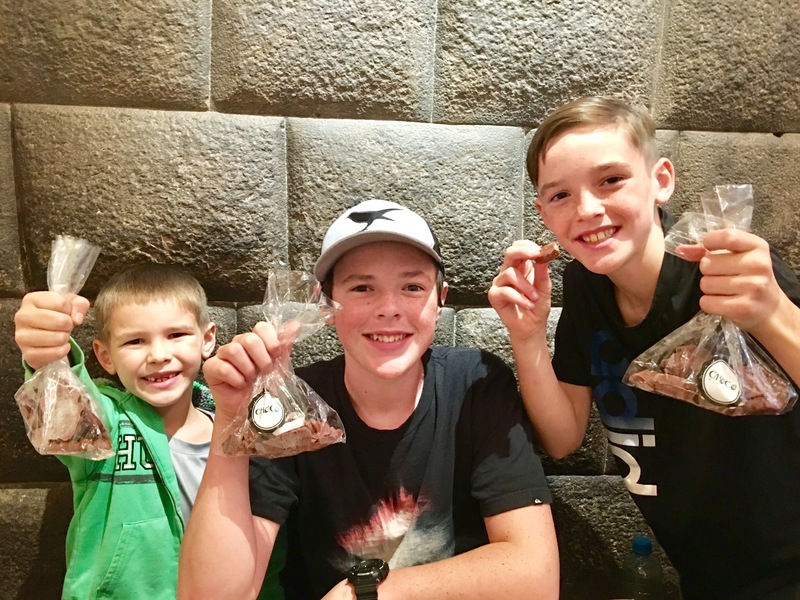 Of course, having Rhyasen heritage, chocolate is in his blood so that makes sense! Following the crushing, the chocolate is then ready to be used in any of the amazing ways it can be consumed. We even tried it the way the Mayans used to drink their hot chocolate with chili powder. Thankfully it wasn’t completely authentic, we opted to use milk instead of the blood they would have used in the past! As we mixed it up, of course, we had to dance! Milk, sugar, cocoa, and cocoa butter are then all combined together to form delicious milk chocolate. 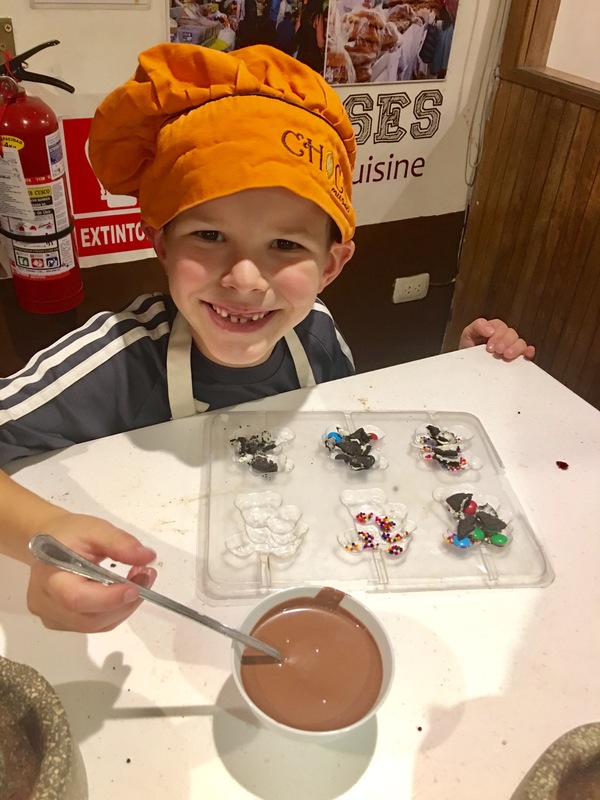 We filled molds with some of our favorite fillings, preparing them to have the chocolate added. 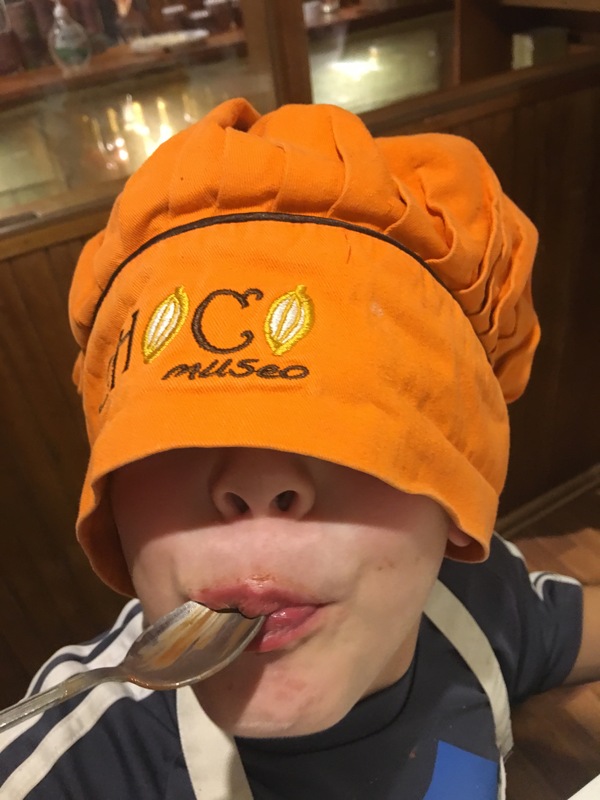 One scoop in the molds and one in the mouth seemed to be the common consensus in our group! 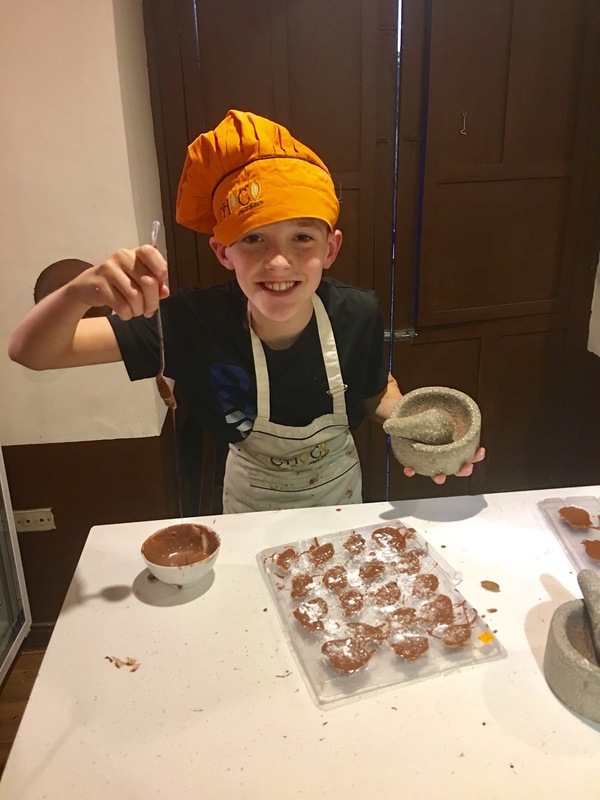 We finished off the chocolate in the molds with a little dusting of powdered sugar on Tylers. The next day we returned for our hardened chocolates. We did a pretty great job, they were delicioso!! 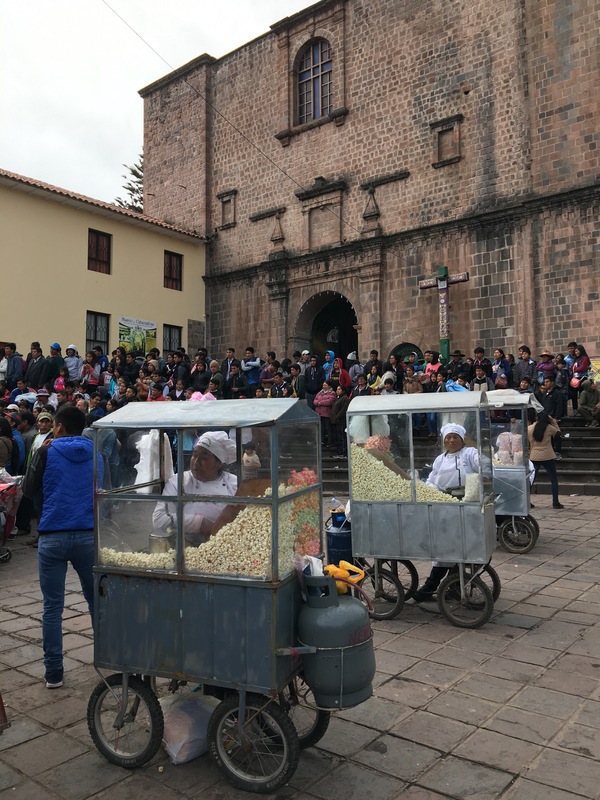 Cusco was amazing! One of my favorite cities on our trip. The only down side was we didn’t have Jeromy there to experience it all with us. At least he was able to be there for a few days with us, and I’m convinced we can try again, just maybe not for a few more years! 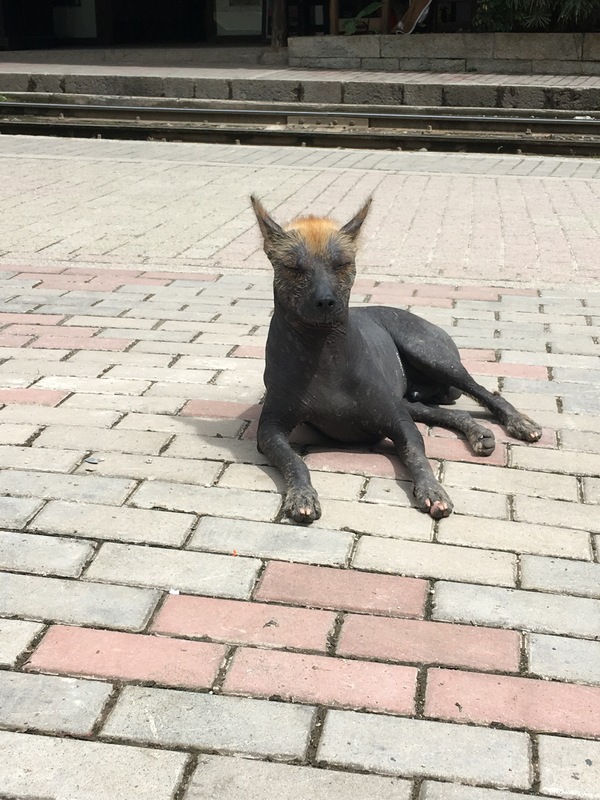 The Peruvian Hairless dog…in my opinion the ugliest dog in the world. 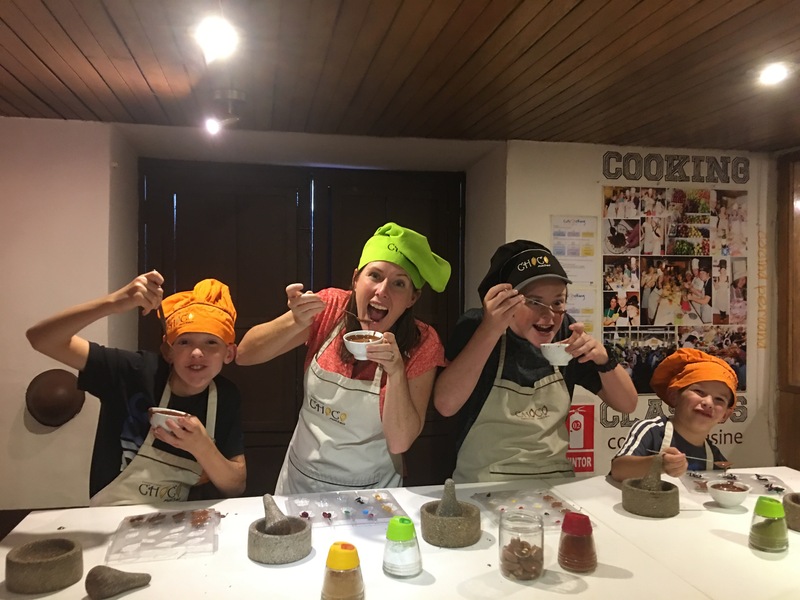 That is amazing that you were able to do this with your family and give that experience to your kids! Looks like it was a life changing experience. So glad everyone is happy and healthy after your family scare!